Hey guys! So if you read my blog regularly, you'll know that I was recently sent a box full of amazing healthy foods and skincare products from the brand AVEENO who challenged me to take on their Inside & Oat challenge for one week. The challenge they set me involved eating healthily, adding some daily exercise to my routine and using their products to nourish my skin. You can read more about it in my first post here but the aim of the challenge is to nourish my skin from both the inside and out to see what a week of changes can make. Since giving the challenge a try, it's time to report back with how I found it and the differences I felt from making some changes. If you follow me on social, you'll probably know I'm already quite into leading a healthy lifestyle and do believe balance is key. I try to be good throughout the week and allow myself a few naughty treats on the weekends. I find that's the best way for me to stay on track during the week - knowing I won't feel guilty when I indulge at the weekend. With this being said, the prospect of following a healthy diet didn't phase me in the slightest - I welcomed it with open arms and couldn't wait to try out some of the recipes from the meal plan AVEENO sent with my hamper of goodies. Now although eating healthily for one week isn't going to make any major changes in terms of weight loss or a glowing complexion, I can definitely say that it makes me feel ten times better about myself and the biggest change for me is the psychological one - that great feeling of knowing I'm looking after my body can't be beaten. I always feel really sluggish if I eat lots of bad food so eating good food definitely gives me lots more energy. As I said, changes to my skin from only a week of healthy eating are unlikely but I can see how my skin would hugely benefit if I were to continue nourishing my body with home cooked food and some amazing ingredients. I've popped some photos in this post of the Butternut Curry I made from the meal plan which was created by Natasha Corrett from Honestly Healthy. This was definitely one of my favourite recipes - it was so tasty and I didn't miss the meat element one bit. It was actually quite refreshing to have a meat free meal and this is something I'll definitely be making again. It didn't even taste healthy as it was so full of flavour. 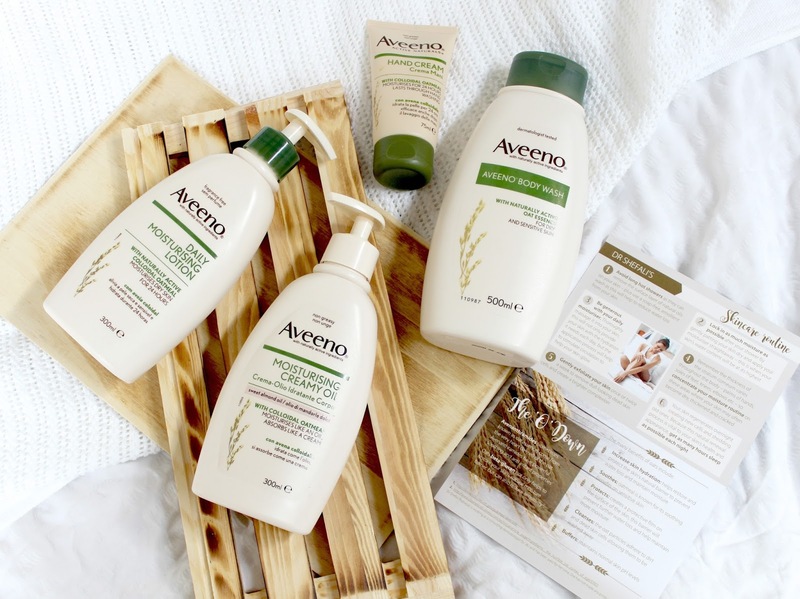 As well as following the heathy eating plan, I also added four of AVEENO's fabulous skincare products to my daily routine. I'd always heard such amazing things about the brand but never tried their products out so I'm really pleased this challenge has introduced me to them. I have to be honest, I'm pretty terrible when it comes to moisturising my body - it often feels like a chore so I don't really bother, unless I'm on holiday when I slather on moisturiser like it's going out of fashion. However, I know moisturising my body should be just as important as moisturising my face so this challenge has given me the kick I needed to start moisturising my body on a daily basis and I've actually really enjoyed it. 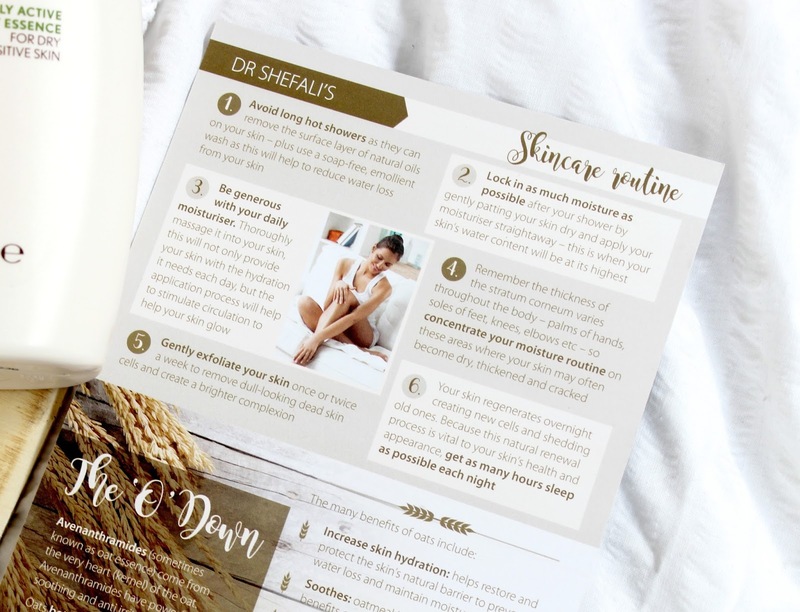 I followed the tips from Dr Shefali's skincare plan, especially the one about not having too many hot showers - who knew it could remove the natural oils from our skin? 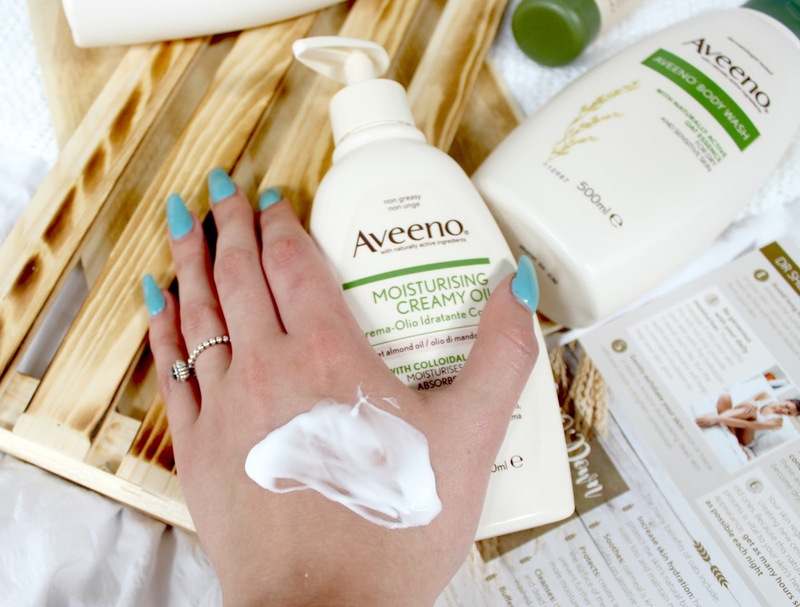 The four products I've been using are the Aveeno Body Wash, Aveeno Daily Moisturising Lotion, Aveeno Moisturisng Creamy Oil and the Aveeno Hand Cream all of which are from AVEENO's daily moisturising range. All of the products contain oats (hence the challenge being named Inside & Oat) which have an array of skin benefits. They increase skin hydration, soothe, protect, cleanse and buffer whilst also being really gentle on sensitive skin. I've been loving every single one of the products as they're all so gentle but also so effective. I love that none of them have strong fragrances which can sometimes irritate and disrupt the PH balance of the skin but they still have a really lovely fresh scent. I also feel like I'm doing my skin good by using them as they all contain naturally active ingredients which have been specially formulated to gently cleanse and moisturise dry, sensitive and irritated skin. My skin does get quite sensitive and can often react to new skincare products but I've had no issues whatsoever with these ones - they just make my skin feel silky smooth and radiant. What's even better is that they're all so affordable and are really accessible on the high street. As I said, I love all of the products but my favourite of the four would have to be the Moisturising creamy oil as it blends into the skin effortlessly making the process of moisturising my whole body so quick and easy. It combines the benefits of an oil with the convenience of a cream and I really love that as it feels so much more hydrating that a normal body lotion but still has a lovely lightweight texture that sinks into the skin in a matter of seconds. Overall I'd say I definitely felt the benefits of taking on this challenge and it's something I'll definitely be continuing with. I'll be referring back to the recipes in the meal plan whenever I want to eat something I know is really good for me and I'll of course continue to use the skincare products too. Daily exercise might not be totally realistic for me but I definitely feel better about myself after doing it so whenever I get chance, I'll be trying to squeeze in a little home workout. I'd love to hear some of your tips for leading a healthy lifestyle so let me know in the comments section below! Really enjoyed this post! How much are the products? Might have to try these out! I like aveeno for two reasons first is a pretty good and second one it is because is very affordable!